Researchers have constructed a network of the relatedness between products, providing insight into the economic question of why some countries can quickly climb the manufacturing ladder, while others fail to develop more sophisticated products. 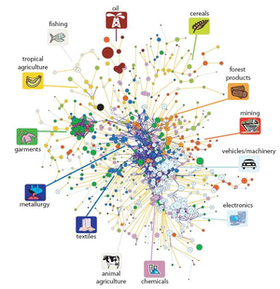 In a recent issue of Science, physicists César Hidalgo and Laszlo Barabási from Notre Dame, along with economists Bailey Klinger and Ricardo Hausmann from Harvard University, have presented a network of what they coined as the “product space.” In the network, connections show the probabilities that a country exports a pair of products. Their results show how the types of products a nation produces and exports determines the probability of that nation developing more competitive products, thus influencing its overall economic wealth and growth. The researchers used trade data where all exports are coded within 775 product classes obtained from a National Bureau of Economic Research project. The structure of the product space is such that more sophisticated products (such as metal, machinery, and chemicals) formed the core, and had connections to many other products. A variety of other products (such as fishing, agriculture, textiles, electronics, and mining) comprised different clusters in the periphery of the product space. The product space can be used to visualize the patterns defined by the exports of a particular country. As a rule of thumb, poor countries tend to occupy the periphery of the space while rich countries are preferentially located at the core of it. Since countries can move through the product space by developing goods similar to those they already produce, poorer countries have a more difficult time extending their product variety. But, in simplified terms, it’s easy for the rich to get richer. While the model may sound intuitive, this research is the first time that countries’ different economic growth patterns have been explained by a product network. Past economic theories have relied on a country’s productive factors (labor, land, infrastructure, etc.) or technological capabilities, but have disregarded product similarities when explaining a country’s growth. In a sense, the product network incorporates these other factors under one model. As part of a test of their model, the researchers asked if, given enough time, all countries could reach most of product space, particularly the richest parts. They found that the answer depends on the overall proximity of product space, as well as a country’s original positioning. For example, Chile and Korea have similar levels of production and export sophistication, but because Korea produces some core products, it can extend its sophisticated product line faster than Chile. The researchers even found that with countries that were developmentally similar, some were on a path to structural transformation while others seemed headed toward a dead end. The researchers suggest that, for economic policy, estimating a country’s position in product space could have important consequences. For instance, countries in close proximity to other products could benefit the most from a relevant structural transformation, whereas countries at the periphery would need to make much longer jumps and would likely present a greater challenge to reform projects. “The proximity between products in the space increases as more countries export them in tandem,” Hidalgo explained. “Thus the movement of countries deforms the space. The technique does not provide a general solution for policymaking, but a new method to analyze and tailor policies for individual countries." Product space networks of many nations can be seen at www.nd.edu/~networks/productspace/country.htm . Citation: Hidalgo, César, Klinger, Bailey, Barabási, Laszlo, and Hausmann, Ricardo. “The Product Space Conditions the Development of Nations.” Science, 27 July 2007, Vol. 317, 482-487.